Are you ready for the holiday season yet? It’s almost impossible to imagine November is one week away and the season’s frenzy is about to start. I know I’m a little behind schedule this year when it comes to planning ahead. 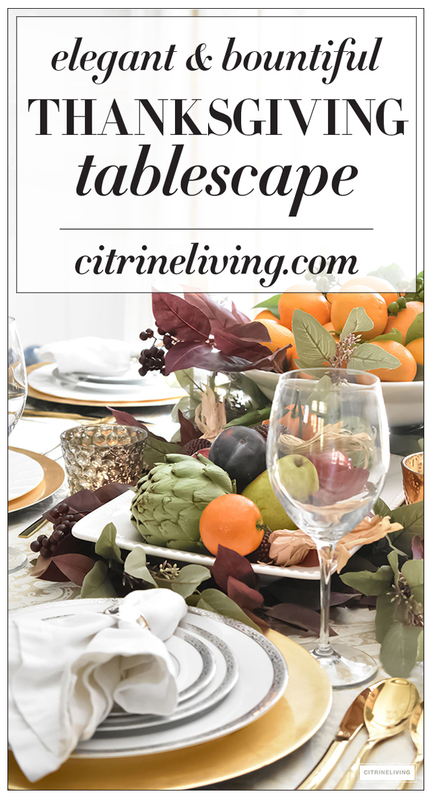 If you’re like me and need some quick ideas to prepare, I have a simple, elegant and bountiful Thanksgiving tablescape that you can easily pull together for the holidays – all with grocery store items. I’m all about quick and easy, but there’s no reason it shouldn’t be fabulous too! I’m always so happy to join in with a very talented group of bloggers for the Styled + Set Blog Tour, hosted by Lory of Designthusiasm. 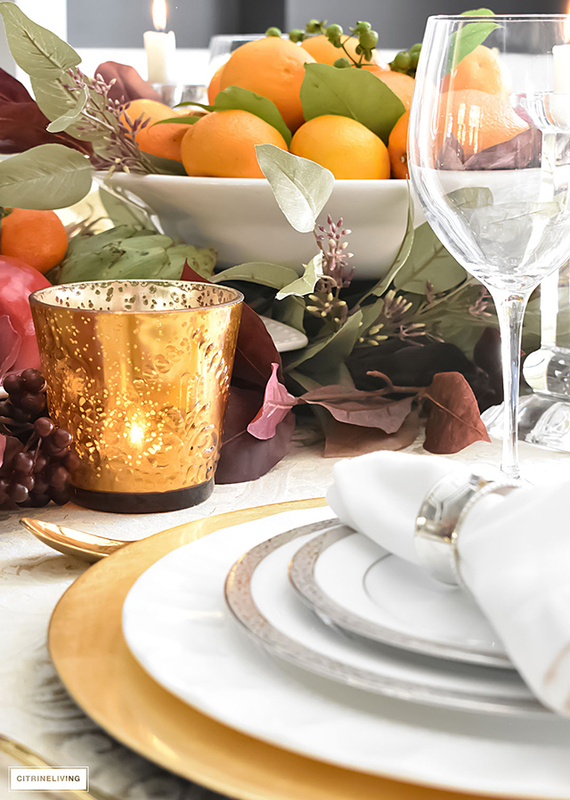 Each season, we gather together to bring you the very best for your holiday entertaining. 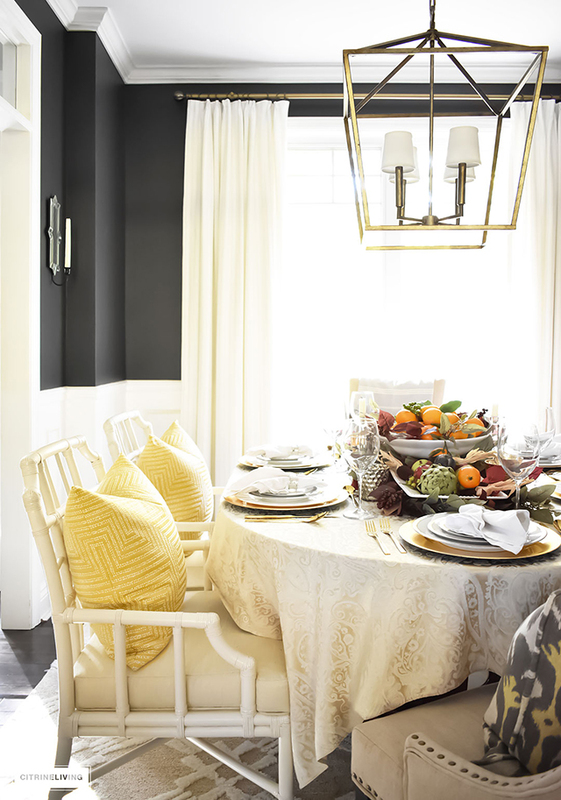 If you’ve just come over from Randi of Randi Garrett Design, you’ve definitely been treated to a visual feast! 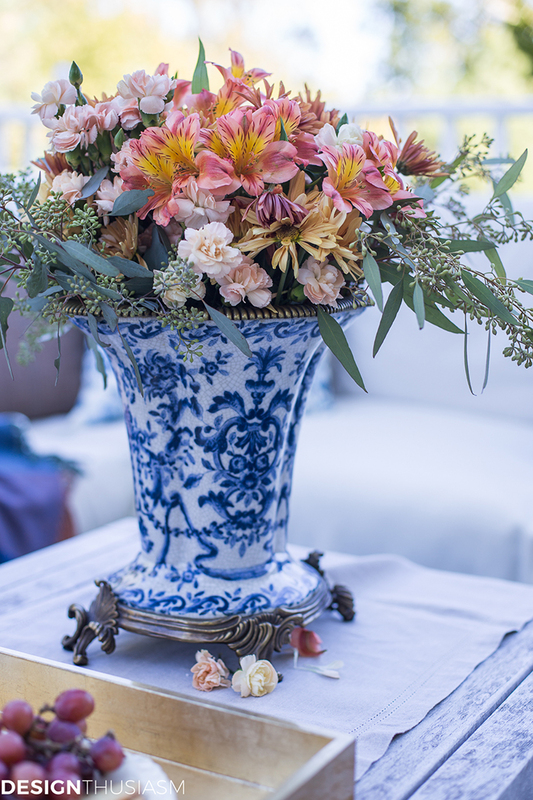 Randi’s tables are always exquisite! Thank you for joining me today, I’m thrilled you’re here and I hope you stay a while! *Affiliate links are used in this post, for either the same, or similar items in our home, for your shopping convenience. While I make a small commission, it is no extra cost to you! 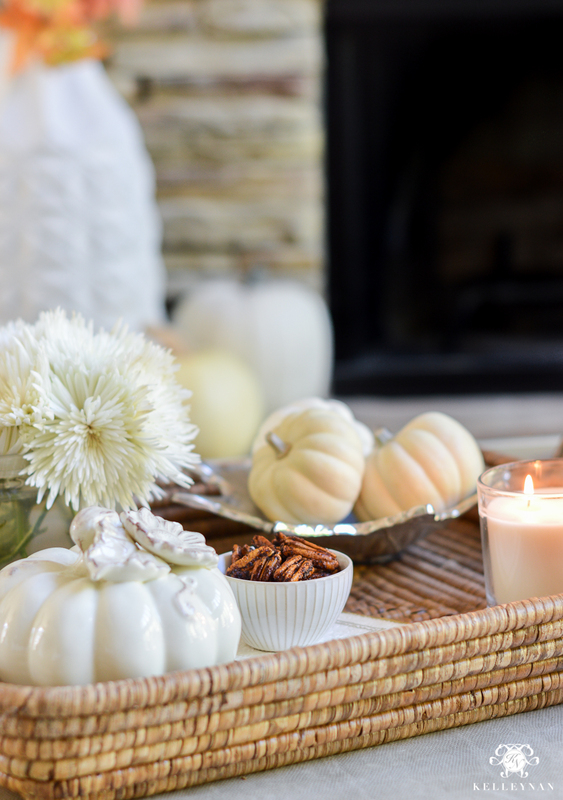 Last year, I also created a simple table, using a few seasonal decorative staples. You can read about it here. Our dining room looked quite different a year ago, and I’m still in middle of transforming it. 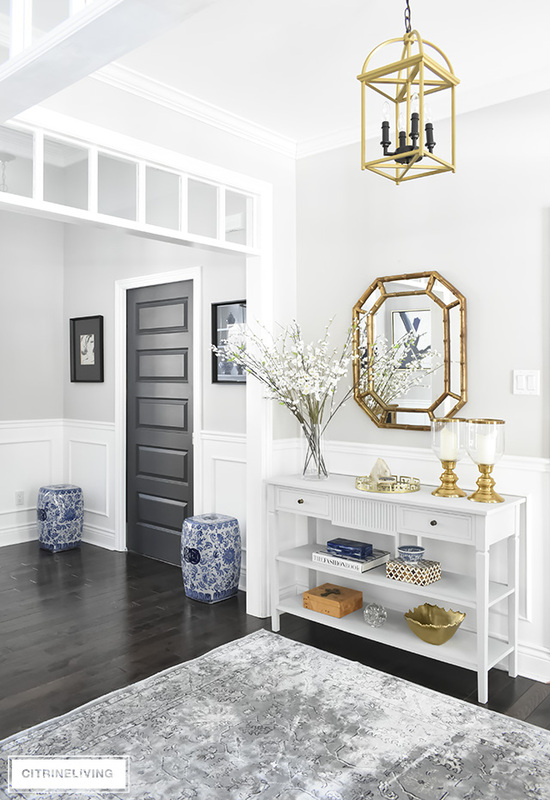 I’m looking for a new table in a light finish and I’ve been debating for a while now about painting our black walls something completely different. 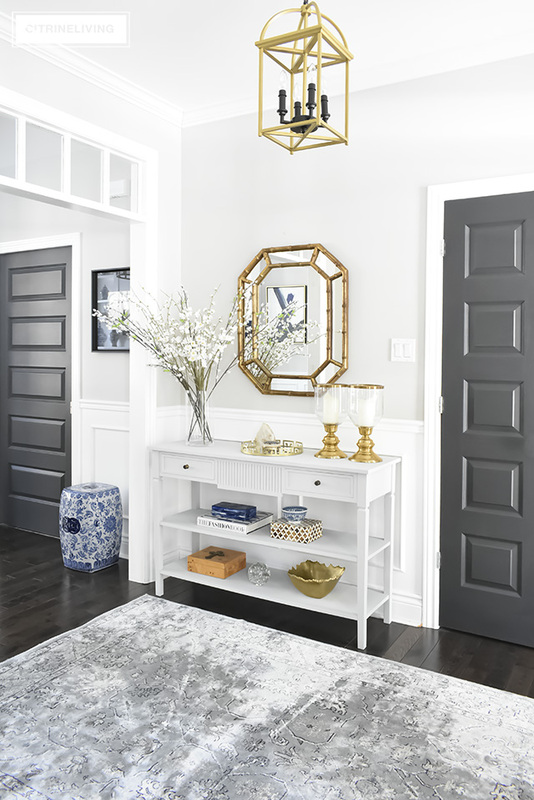 If you’re new to CitrineLiving, you’ll see that I love to use anything brass or gold. 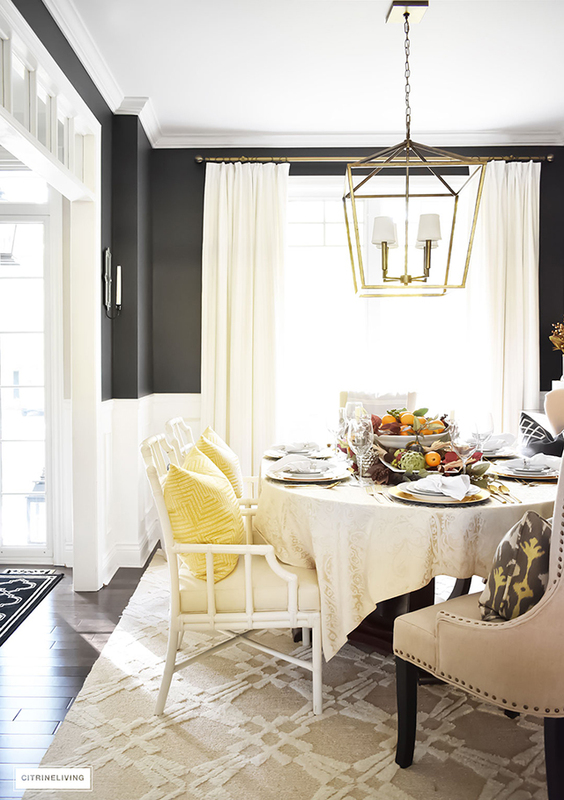 It’s a constant theme in our home, from lighting to fixtures and also on my tables. You’ll notice that I also love to mix metals, which is easier than you think. It took some tweaking to get it right, and I’m very happy with the results. 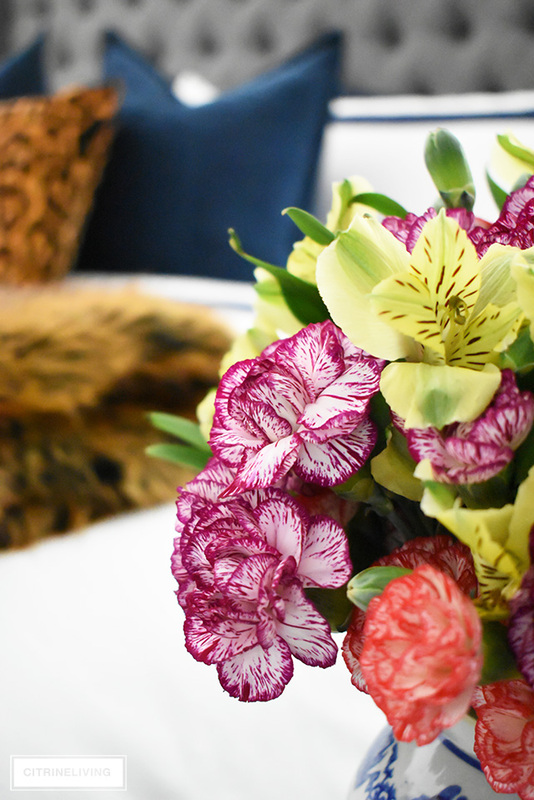 By the time I got home from the grocery store, my $50 flowers (yes, I was desperate) didn’t go with my concept one bit – they were far too Springlike, so I ran back to the store and grapped some oranges to take their place. I added a mix of fresh and faux greenery and foliage to complete the look. 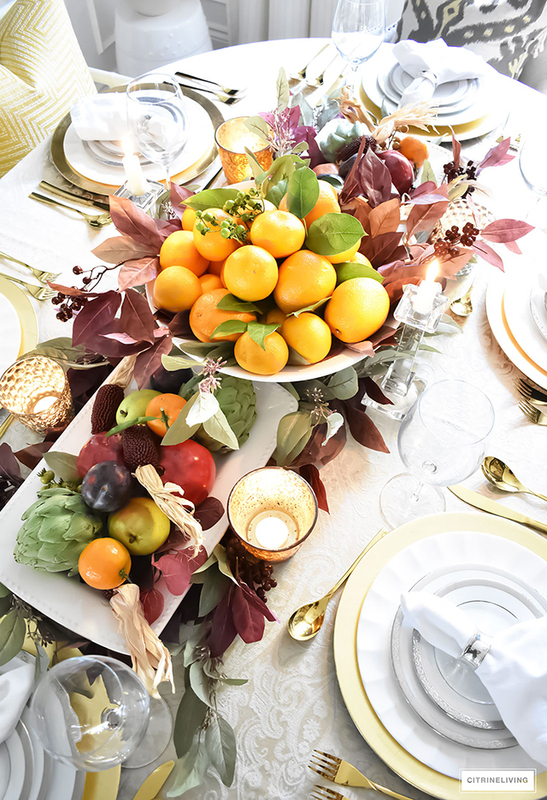 Last month I created a Fall table using only faux foliage and let me tell you, these faux stems quickly became my best friend this past weekend! You can see that table here. 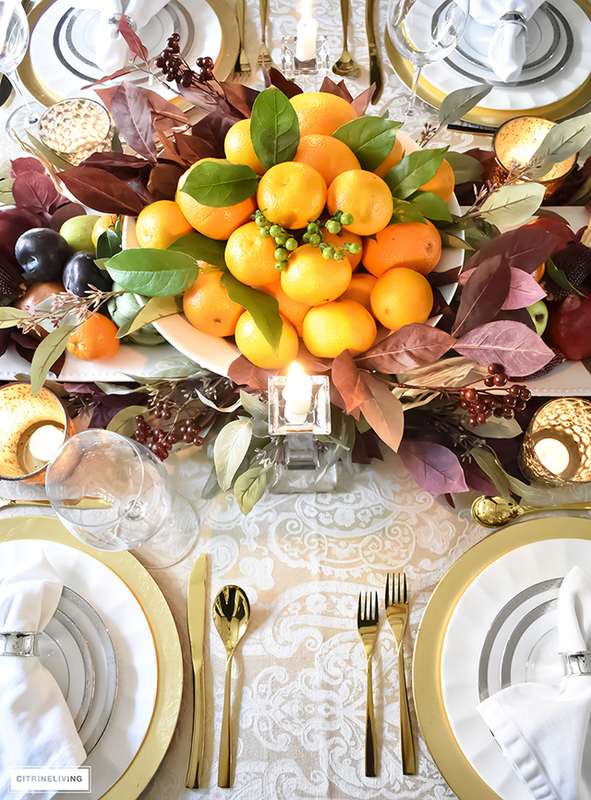 Once I arranged all of the fruit on my side platters and footed bowl, I used my faux stems to create a base for each fruit platter. After placing my footed bowl with the oranges in the center, I simply wrapped some more of the faux stems around the base to build it up and fill in all of the empty pockets. I used fresh greenery and berries from the flowers I had bought (I guess it wasn’t a total waste! 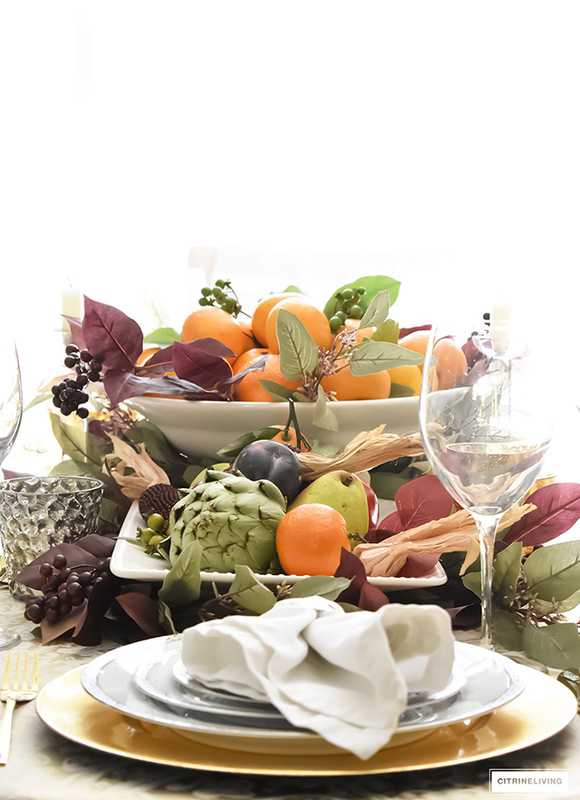 ), and tucked them in and around the oranges, along with a few faux sprigs as well. I cut off the branches individually from some other stems and tucked the extra pieces to fill it in even more. 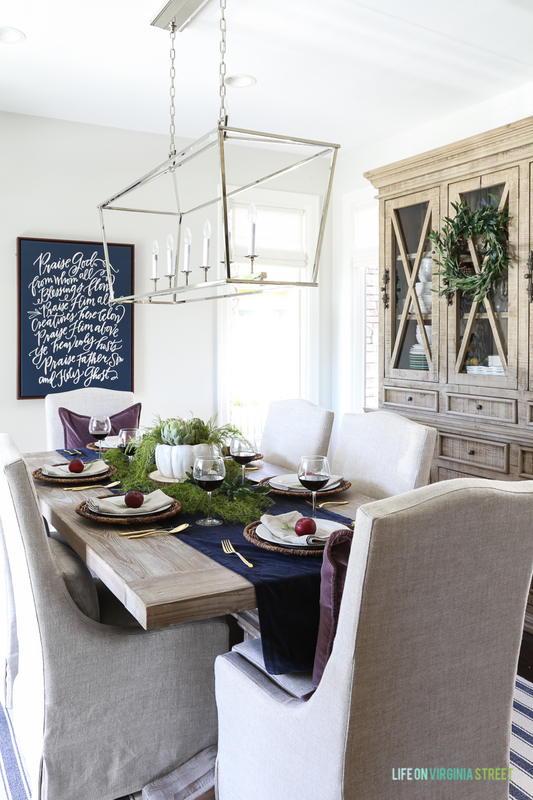 The beauty of having an inventory of faux foliage is that you can reuse it for so many different occasions – and not only on tables. I love to use fresh greenery also, and I’ll often go out into our yard and cut some branches to bring the season indoors. So simple and so affordable. You can see how I easily did that for Summer (here) and Fall (here). 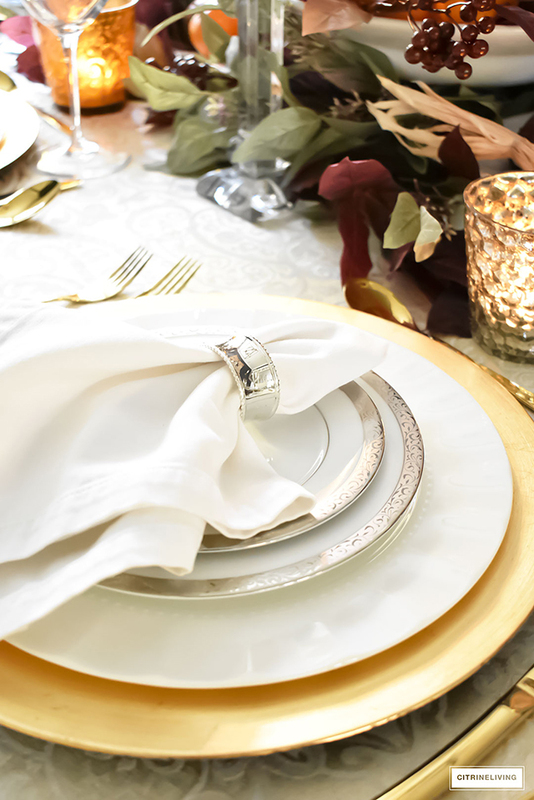 Getting back to mixing metals, I used my wedding china with silver trim and mixed it with my gold chargers and flatware – mixing is fun and casual and brings a little bit of variety and personality to your table. 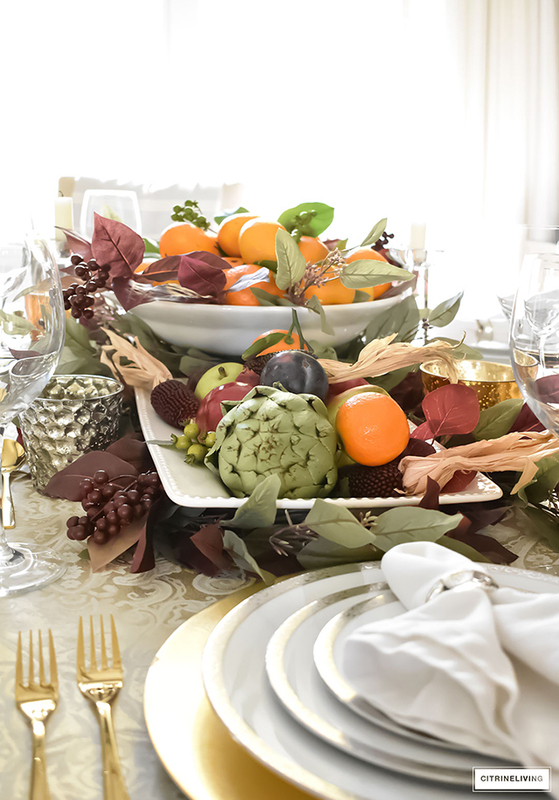 The gold tones work so beautifully with all of the autumnal hues of the fruits. 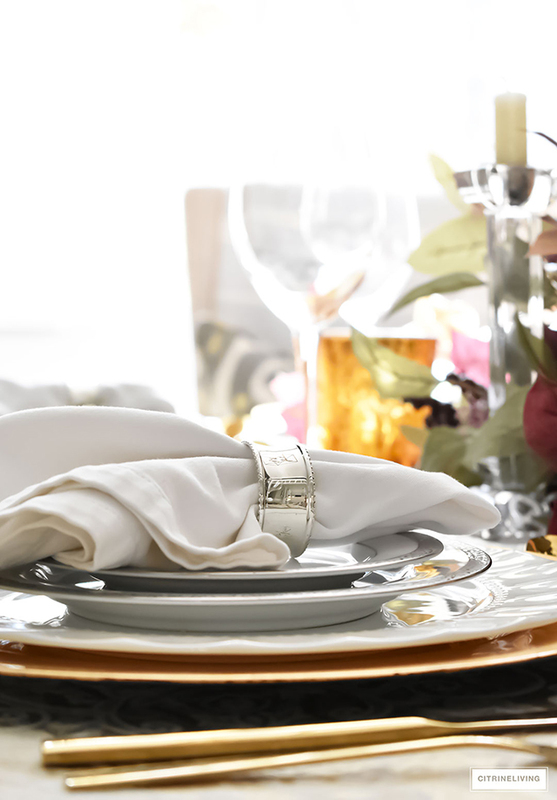 Simple stemware keeps the table from becoming too busy as well. You can definitely add some detailed crystal to the mix if you want! You can make anything work as long as you’re balancing out the elements – if one thing on the table is dominant, keep the other items more simple. That’s my personal preference, but really, it’s up to you! 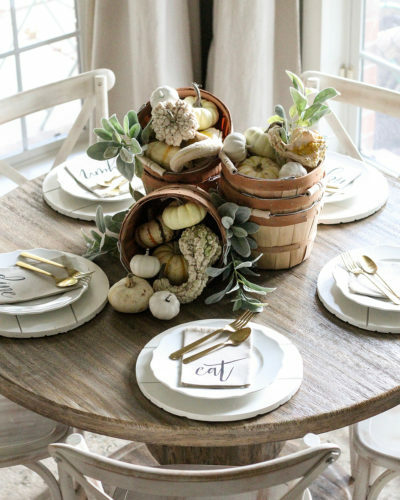 Use your tablescape as a way to express your creativity! 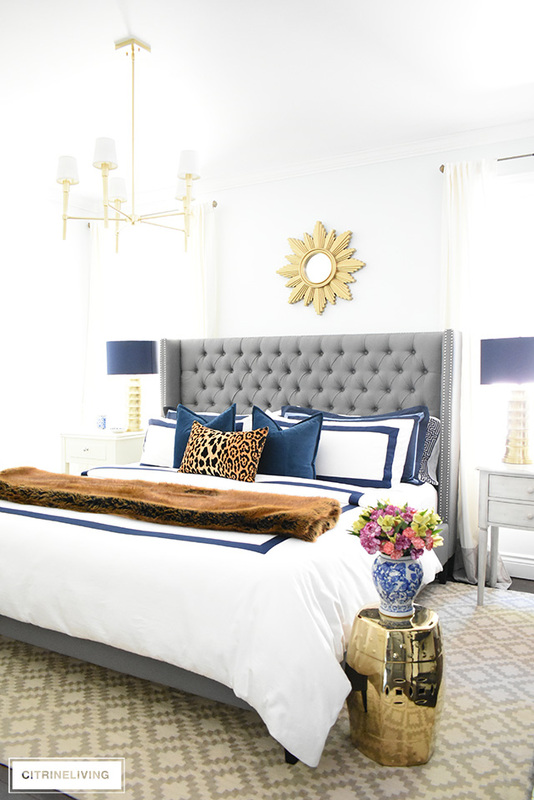 I brought out our new gold pillows from our master bedroom (see it here) to reinforce my color palette even further – I’m always moving our pillows around to create a fresh new look throughout our home. 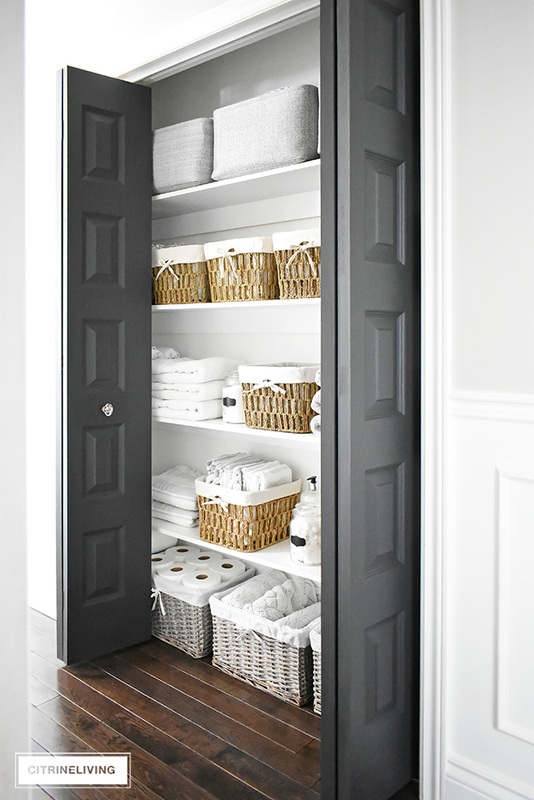 It’s such an easy way to breathe new life into your home. perfectly beautiful. 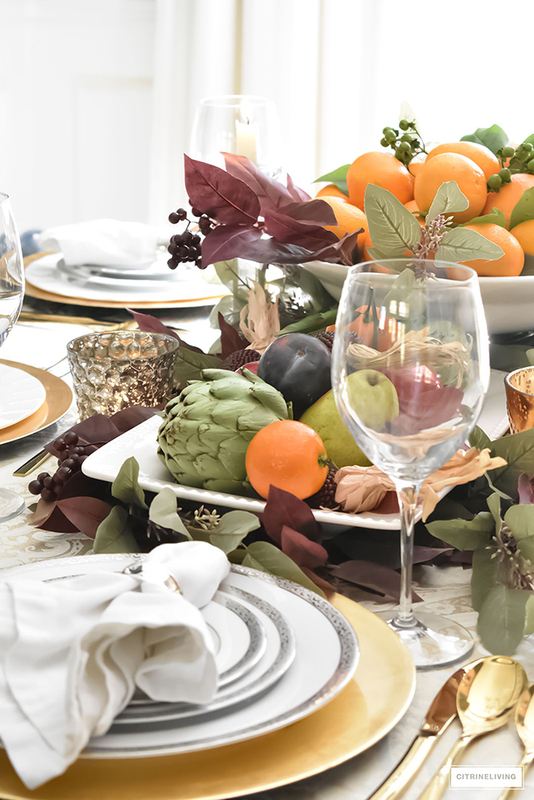 I love the oranges as a centrepiece. The photo you took directly from above the bowl of oranges is awesome!!! Thank you so much Marion! I am very happy with how the oranges turned out – even though it was so last minute! I’m glad you like it! Thanks for reading and for stopping by! These colors, oh my word!!! They are so warm and happy. I love it!! 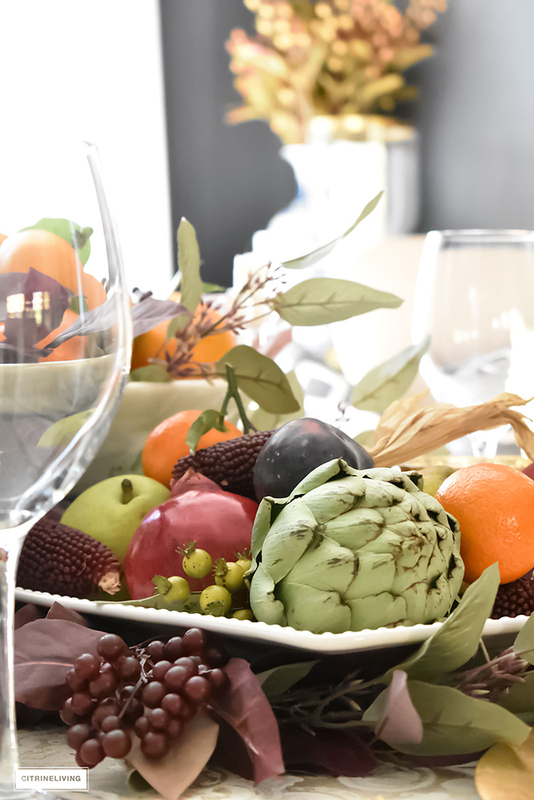 Love your “on the fly” centerpiece. The oranges are a unique and refreshing touch. Beautiful! Thank you Jennifer! I’m so glad you like it! I love the oranges far more than I expected, so that makes me really happy! Lory thank you so much, that really means a lot to me! I have been debating going light for a long time, just for something new! But I’m still on the fence! So beautiful Tamara! 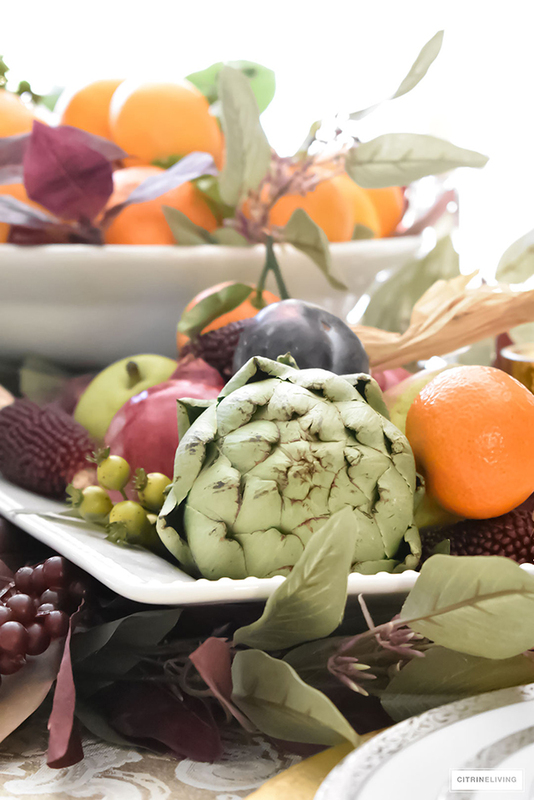 Love how you used artichokes and pears! Such a great idea! 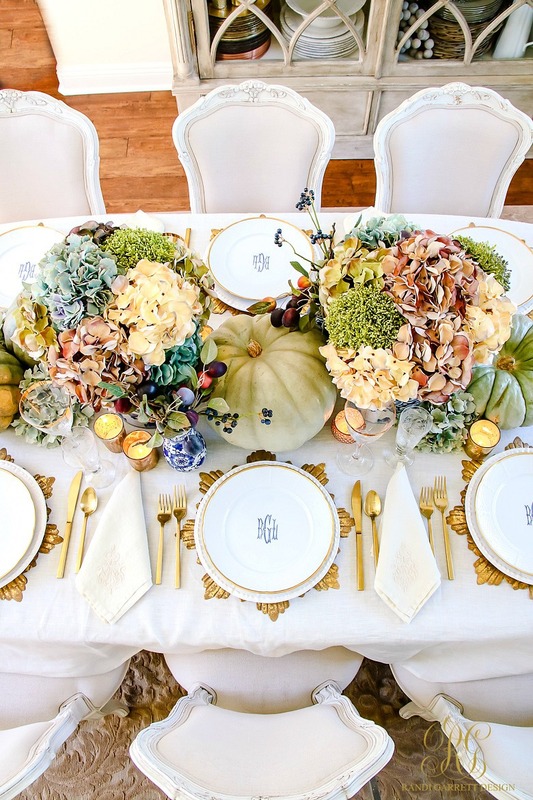 I love how you incorporated so many organic elements throughout your table setting! 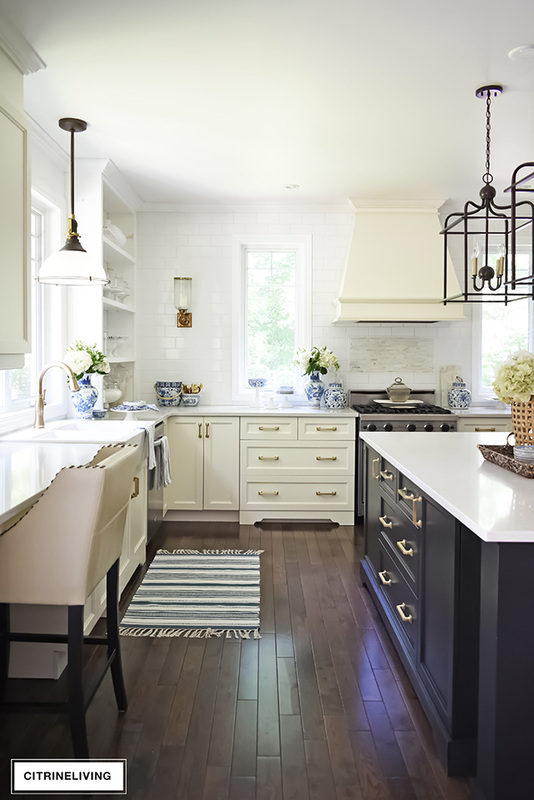 I am a firm believer that they add so much charm and character to any space! Beautiful! Tam, your bounty is beautiful! 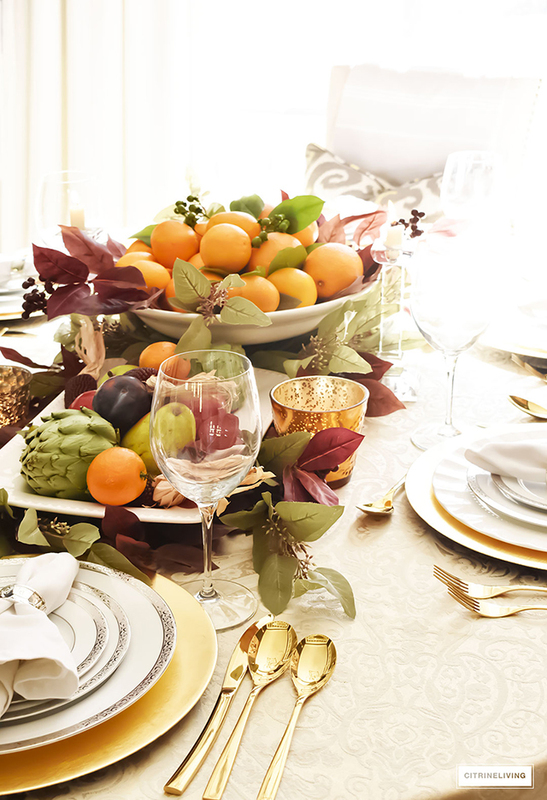 Those oranges made the perfect centerpiece. I hope you saved those flowers for your next project! As always, this is amazing! Tamara, I absolutely adore this sumptuous table! 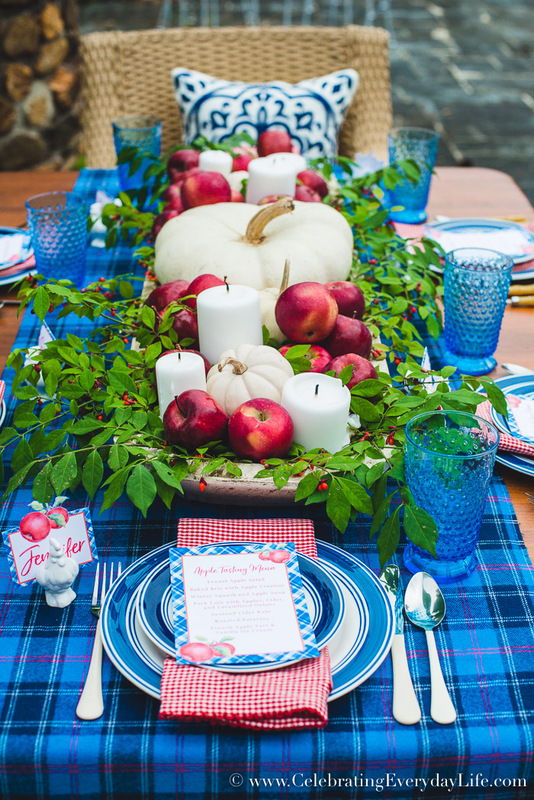 The warm colors of fall and all the fresh produce is so lovely – and edible for after the event too! What a wonderful celebration of fall!